We operate the farm with a “beyond organic” philosophy. We are not certified organic because organic principles just scratch the surface of what we practice here at Independence Homestead. Generally speaking, organic products are produced without pesticides, synthetic fertilizers, GMOs, antibiotics, or growth hormones. Isn’t that the bare minimum you would want in terms of food for yourself and your family? Here at Independence Homestead, we go a lot further than that. 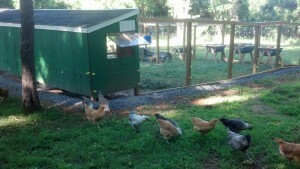 We start with non-GMO, pesticide free, locally sourced, livestock feed. We then give each animal the space and environment it needs to do what God built it to do. Our chickens range on pasture, eating whatever seeds and bugs they scratch up. Our goats forage in the woods, munching on leaves and shrubs. This alignment with natural behaviors minimizes inputs needed, lessening the farm’s environmental impact and keeping costs down. For those animals destined to be meat, we process our poultry and rabbits here on the farm, which allows us to control every aspect of their production and ensure our standards are upheld. It eliminates the stress of transport, ensures animals are killed humanely, and keeps our meat out of large processors where it could be contaminated by other meat. We are also able to process our meat in comparatively small batches and use the best processing techniques, such as air chilling our chicken and packaging each in a shrink-wrap bag. Starting at the most personal level of your own body, according to an article from Health.com, one study found that “organic chicken contained 38% more heart-healthy omega-3 fatty acids” and another study stated in its tests “fewer than 6% of organic birds were infected with salmonella, compared with almost 39% of conventional ones”. Those results were based on conventionally raised chickens that were just fed organic feed, imagine the difference with our birds that are pasture raised, moving to fresh grass daily, and supplemented with the best organic feed! How about the health of your children? According to a study published in the magazine Pediatrics, which is the official journal of the American Academy of Pediatrics “epidemiologic evidence demonstrates associations between early life exposure to pesticides and pediatric cancers, decreased cognitive function, and behavior problems.” In fact, when your children are still in utero exposure makes a difference, Time magazine cites a study that “tracked women exposed to higher amounts of organophosphate pesticides while pregnant and found that once those children reached elementary-school age, they had IQs averaging several points below those of their peers.” Organic feed is grown without these harmful pesticides, and obviously we do not use such pesticides on the farm, either. That same Time article states that “choosing organic meat and dairy for your kids is also the best way to ensure that they’re not exposed to endocrine-disrupting chemicals like the synthetic hormones given to nonorganic livestock to speed growth and alter reproductive cycles.” None of our animals are given any hormones by us. The only hormones they have are the ones naturally produced in their bodies. A Rodale News article asks the honest question “did you know that more than 90 percent of the eggs produced in this country come from hens crammed into tiny cages and given feed loaded with antibiotics?” This characterizes the “factory farming” method that makes up conventional livestock production across the United States. Animals are packed in at population densities that are unhealthy in order to maximize profitability, and the environmental and health impacts are as concentrated as the animals. Then, in order to prevent underperformance and mass casualties due to the unhealthy environment, they’re pumped full of drugs such as synthetic hormones and antibiotics. In a recent Washington Post article, Consumer Reports states that eating organic poultry is a medium to high priority to “discourage the routine use of antibiotics.” The heavy use of antibiotics in particular is getting a lot of press as it is leading to antibiotic-resistant bacteria that is causing illness in people. Here on our farm, the only thing that goes into the animals other than what they forage is organic feed, water, and natural supplements such as grit, oyster shells, kelp, and probiotics. There are never any antibiotics or hormones used. Factory farming causes a host of other problems, such as creating too much manure in too small of an area for it to decompose naturally. This report notes “most industrial operations store waste in massive lagoons that can hold millions of gallons of liquid manure.” This concentration of manure is having environmental impacts because “manure gets into surface and ground water when lagoons spill or break. In fact, “the EPA has identified poultry manure as the largest sources of excess phosphorus and nitrogen in the Chesapeake Bay and found that the nutrients have created a dead zone as plants and aquatic are smothered from lack of oxygen.” Here on the farm manure is a good thing: it fertilizes our garden and pasture! Some ages first on the compost pile, but all of it adds nutrients to the soil to increase its growing potential. This is possible because we do not practice high-density factory farming, we give the animals some space! What makes all of this worth it isn’t just the health benefits, it’s the taste! Our farming practices make a difference in the taste of all our products.